Main Street Point Pleasant, Inc. 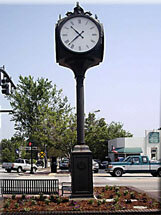 The Main Street Point Pleasant, Inc. organization along with other civic organizations plan to raise the necessary funds to place a Town Clock, similar to one of these pictured at the left,at the intersection of Fourth and Main Street in Downtown Point Pleasant. We believe this will add significantly to the architecture beauty of this area which is the main intrance to the Point Pleasant Riverfront Park. 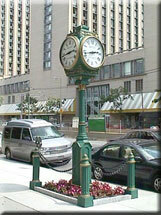 A clock design will be chosen to complement the historic architecture of downtown and enhance the Streetscape Project. If you or your company of organization would like to contribute to this project, contact Charles Humpnreys, Executive Director - Main Street Point Pleasant, Inc.
Copyrighted 1997 - 2009 Main Street Point Pleasant, Inc.